Substantive practice areas in environmental law include CERCLA, RCRA, CWA, CAA, ESA, and their respective state-law counterparts. 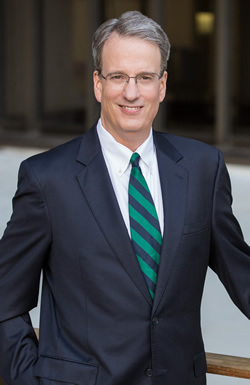 His environmental litigation practice includes representing clients in private and government cost recovery actions, federal and state civil enforcement actions, and administrative proceedings. Michael’s transactional and regulatory compliance activities include negotiating, drafting, and due diligence investigations related to environmental matters in real estate and business transactions and providing counsel on compliance and permitting matters. Michael represents businesses, individuals, shareholders, officers, directors, and public entities. Michael emphasizes identifying, at the outset, client objectives and implementing a cost-effective strategy to best achieve those goals. Michael is recognized by Martindale-Hubbell as an AV® Preeminent™ Peer Review Rated lawyer and he was named to Sacramento Magazine's Top Lawyers List in 2016 and 2017. Defended officers, directors, and shareholders against alleged claims of liability under federal and state laws for environmental contamination arising from managing a manufacturing operation. Defended agricultural interests against claims of environmental contamination liability arising from the use of herbicides and pesticides. Defended city against claims for recovery of cleanup costs associated with environmental contamination. Represented plaintiffs for recovery of costs of cleaning up environmentally-contaminated industrial property. Defended two major oil companies against claims for recovery of environmental cleanup costs associated with former service station location. Defended seller of real property against claims for alleged non-disclosure associated with pre-existing environmental contamination. Representation included persuading the regulatory agency to issue a “No Further Action Required” letter and foreclosing on the deed of trust which secured the debt owed to the client. Defended major homebuilder over alleged claim of exposure associated with water damage and mold. Defended entertainment company against claims for alleged violation of Proposition 65 arising from sale of jewelry. Defended state agency in enforcement action by USEPA for alleged violations of the Clean Air Act, Clean Water Act, and Resource Conservation and Recovery Act and in enforcement action by local air pollution control district for alleged air emission violations. Defended computer disc manufacturer in administrative hearing proceedings for alleged violations of local air pollution control laws. Represented furniture manufacturer for alleged violations of Clean Air Act. Defended environmental consulting firm in underlying administrative law proceedings between former client and regulatory agency relating to administrative order providing for cleanup of environmentally contaminated site. Defended manufacturer in enforcement matter by district attorney for alleged violations of state laws regulating hazardous materials and storm water discharge. Represented lumber supply company in regulatory proceedings associated with environmental cleanup of adjacent real property. Represented owner of real property in administrative proceedings associated with environmental contamination on adjacent property arising from dry cleaning operations. Defended service station operator against alleged violations of local air pollution control district rules associated with vapor recovery. Represented roofing company in enforcement action by district attorney for alleged environmental contamination arising from waste roofing material. Successfully caused state regulatory agency to remove client from administrative order for the cleanup of groundwater contamination. Represented developer in investigation by district attorney involving alleged destruction of protected species habitat. Investigation dropped. Represented owner of commercial property in regulatory enforcement matter and in dispute with contractors arising from alleged violations associated with the drilling and closure of water wells. Represented automotive repair company in enforcement action by district attorney for alleged violations of hazardous substance/waste laws and regulations. Represented developer in administrative enforcement by Corps of Engineers for alleged filling of wetlands. Represented residential tenant against allegations that use of septic system violated county ordinances. Represented potentially responsible parties for the Purity Oil, Omega Chemical, PRC Patterson, and Gibson Environmental Superfund sites. Represented distributor of petroleum products in clean up of environmentally impaired real property. Obtained insurance coverage. Represented potentially responsible parties in recovering reimbursement from the State of California Underground Storage Tank Cleanup Fund for cleanup costs. Represented developer in negotiations with DTSC regarding prospective purchase agreement relating to contaminated property. Represented ground lessee in negotiations among major oil companies, landlord, and subtenant regarding environmental cleanup of former service station site. Provided advice to clients either purchasing or selling properties with environmental contamination and negotiating contract terms associated with environmental liabilities and cleanups. Represented potentially responsible party in negotiations with DTSC regarding the recording of land use covenants against environmentally-impaired property in order to allow real estate development. Provide advice to owners of real property, purchasers of real property, and contractors regarding compliance with rules and regulations associated with asbestos-containing materials. Represented owner of real property regarding claims of alleged violations associated with nearby landfill. Provided advice to manufacturer regarding compliance with Clean Air Act, Clean Water Act, Resource Conservation and Recovery Act, EPCRA, and their California law counterparts. Provided advice to clients on devising, implementing, operating, and monitoring Environmental Compliance Management Systems and providing advice regarding results from environmental regulatory compliance audits. Represented sellers of international consulting business in litigation brought against the purchaser, a publicly-traded foreign mining company, for failing to pay the final adjustments to the purchase price. Representation included a separate proceeding before an accountant which made certain determinations on disputed accounting matters. Defended private high school and order of nuns in litigation commenced by individual donors and a bishop of the Roman Catholic Church for alleged misuse of donated funds. Trial court denied Plaintiffs’ motion for preliminary injunction and the trial court’s decision was upheld on appeal. Defended general partner in litigation commenced by major commercial lender for foreclosure on deed of trust (which involved commercial airport property) and enforcement of partner’s personal guaranty of certain debts of the partnership. Litigation included a hearing to determine the “fair value” of the real property and appeal. Represented non-profit provider of foster care services in litigation brought against a foreign corporation and a California company for breach of contract and fraud regarding defendants’ development of a software program. Defended attorney in litigation against claims of breach of fiduciary duty and intentional interference with contract relating to business transaction in which attorney allegedly personally benefitted. Represented manufacturer against claims by Business Software Alliance for alleged infringement of copyrights associated with multiple computer programs. Defended real estate development corporation in litigation commenced by minority shareholders for alleged fraud and involuntary dissolution of the corporation. Defended construction company in litigation commenced by minority shareholder for alleged fraud, breach of employment contract, and involuntary dissolution of the corporation. Corporation exercised its right to acquire minority shareholder’s shares at “fair value” to prevent dissolution. Represented members of limited liability company in litigation brought against managing member for alleged breach of fiduciary duty and fraud and for appointment of a receiver. Represented fifty-percent shareholder against other fifty-percent shareholder in corporations for appointment of a provisional director to break the deadlock at the board of directors. In multiple matters involving corporations, represented shareholders and/or company involving claims for dissolution and appointment of a receiver. Defended individual guarantors in litigation commenced by major commercial lender for enforcement of personal guaranties for non-payment of loan by borrower. Acted as local counsel in federal court for franchisor in litigation commenced by franchisor against franchisee for alleged breach of franchise contract. Defended dairy farmers in litigation brought by real estate developer for alleged breach of option agreement regarding the suitability of replacement property which was to have been suitable for the discharge of dairy waste. Defended non-profit seller of real property in litigation against claims of alleged fraud and non-disclosure relating to the condition of the real property. Defended owners of real property in eminent domain litigation (condemnation) commenced brought by local and state public entities. Represented owners of real property in disputes with adjacent property owners over easement rights and other claims of property rights. Represented non-profit organization in county enforcement proceedings regarding alleged violations of zoning ordinance. Represented resident in county administrative hearing over issuance of permit to adjacent owner of commercial property for new construction. Represented mortgage brokerage in investigation by federal agency for alleged unfair business practices and alleged statutory violations. Represented meat packing company in antitrust investigation by United States Department of Justice. Represented agricultural cooperative in antitrust investigation by United States Federal Trade Commission. Local counsel for major sports association in antitrust litigation. Johnson v. Knowles, 113.F3d 1114 (9th Cir. 1997), cert. denied, 522 U.S. 996 (1997).